I had been holding in a little secret all week long....it was difficult but I never spoiled it! I had bought the girls and I tickets to the Jonas Brothers Burning Up Tour a little while ago and never told them! We found out about the concert just a couple of weeks ago and I told the girls the concert was sold out and there was no way we could go(there were lawn tickets left-but I didn't tell them that:). There hopes were dashed. They REALLY wanted to see the Jonas Brothers "in real life" as Ella put it. When I told them we couldn't go, Aubrey's eyes even got watery:( And at first, I really didn't think we could go. I had hoped, but didn't think it would happen, so thats why I told them we couldn't go. So, that if we didn't, they weren't expecting it anyways. And if we did, it would be a total surprise. It didn't look good-Joey would be out of town the night of the concert and I didn't want to ask anyone to watch Cali. My good friend, Sheri, heard Aubrey say that there was "no way" she was going to get to go to the concert and told me she would be happy to take Cali. Wow-I was shocked and extremely grateful!!! You are so awesome Sheri-I owe you BIG! We couldn't have done this without you! THANK YOU! So, with someone to watch Cali, I then secretly bought the tickets. I waited until right before the concert to tell the kids. I had told them we would be visiting my sister in Arlington that night and doing something fun ,but they had no idea what it was. Right before we left I said, "We really aren't going to visit Tara tonight" and they both frowned. Then I handed Aubrey the envelope with the tickets inside and said, "We are doing something different." As she opened it and realized what they were, her eyes got huge, and she smiled the biggest smile ever and said, "Yes! Thank you Mom! Thank you Mom!" Ella was like, "Wha?" And then Aubrey told her and they were both totally stoked. We met up with my sister, Tara, and my aunt Cindy and then we partied it up with the Jonas Brothers and Demi Lovato! It was a fun night-a night I know they'll never forget. Aubrey & Ella at their very first concert wearing their very first concert tour t-shirts. Those buggers were expensive, but I figured since it was their first concert, I had to get them the tour shirts! Are they coming out yet? There was a huge wait in between the opening act(Demi Lovato) and the Jonas Brothers. Every few minutes the people in the front would scream as if they were coming out. There were about 20 false alarms:) This picture is during one of those alarms. Aubrey is studying the stage quite closely to see if she can spot a JoBro. Aubrey was beaming all night. This was a dream come true for her-she told me thank you seriously 20 times:) Worth every penny. . .
Tara surprised the girls with some really cool glow sticks. Ella had fun shaking hers. The girls got to sign the tour bus after the show. Aubrey wrote, "I love you Joe" :) I think Ella just wrote her name. They have now made their mark in history. It was a great show! Those boys know how to perform! And it was an extra bonus getting to see Demi Lovato perform(from Camp Rock). She has an awesome voice. There were lots of special effects and there was even a part where the boys were on these really tall platforms singing. I took a picture of it, but its hard to tell how high they are in this picture. The stage all lit up. Burning Up is my favorite Jonas Bros song. Whats yours? Thanks for coming with us Tara and Cindy. It made it extra fun to have you with us. And Daddy, we missed you! I'm sure the girls will remember this night for a long... time. It was neat that Demi Lovato was there. I really like the girls new Jonas shirt's. I've never heard of signing a tour bus before. Fun idea! I'm glad you guys got to go and that Cindy and Tara got to go with you. What a cool Mom you are! wow that makes the text message from my friend Santa pretty lame in comparison. What a fun time. I hope that it doesn't make your Disneyland trip anticlimatic. You are one cool mama! It looks like you gals had a fun evening. I think it would have been cool to sign a tour bus. Lucky! WOW, you are one rockin' mom. Glow sticks too, I'm jealous-- why do I not know who the Jonas brothers are? Is it because I have boys? its funny how the two people who don't know who the jonas bros are only have boys:) its totally a girl thing! these guys are disney's latest craze. they are the hottest thing right now. i was just as excited as the girls to see them live! tara and i tried to start a chant....didn't work out as we planned. everyone just stared at us like we were stupid. Oh, Miss Maya would be very jealous to hear about this! She's a big fan -- used to sort of be in the closet but she's outing herself all over the place now. Fun times! how fun! i bet that's something the girls will always remember - their first concert! That is so awesome. I wish I could have gone when they were here. What a FUN surprise! Your girls are adorable, you can totally see how excited they were in your pictures! My little sister (who's 13) was there last night too...too bad I didn't get to go! One day I want to surprise Janelle with a Hannah Montana concert, but those tickets are nearly impossible to get. One day! we did almost the EXACT SAME THING last october for our girls with hannah montana up in slc. we told them we tried, but then planned a family trip up there after they had forgotten the weekend. we told them right as we stood outside the delta center watching concert goers going in. it was awesome! You are such a fun mom. They will definitely remember that forever. I think I was 8 or so when I got to go to a "New Kids on the Block" Concert at BYU. Had the t-shirt and everything. Anyway, great memories. That's so cool you made some great ones with your girls. You are voted one of the coolest moms. 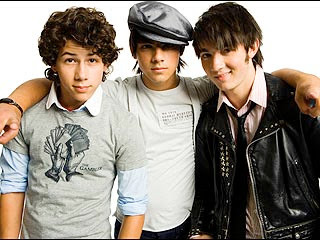 My kids saw Hanna Montana but what they wanted was Jonas Brothers. I am not a poly, but I am married to a Tongan. I am fluent(sp?) in the language, they call me the white tongan. Yes, I agree any mix children are cute I agree. Maybe next time they come to Dallas I can join your girls group. It looks like you guys had so much fun. Could you be any cooler? You are going to be the mom at school that all the kids wish was there own. My mom was kind of like that. Only the boys wanted to do her. Not really the same sort of excitement from my standpoint. it looks like i have to take some "cool" lessons from you...how fun!! and I wish i was hitching a ride to Disney with you! have a great time! What an awesome fun memory for you and the girls. Brownie points for Mom!